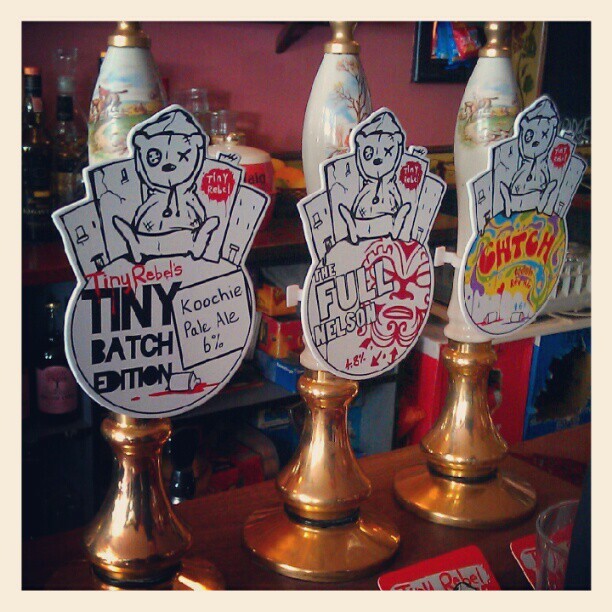 Last Saturday, I was lucky enough to go for a day trip to Bristol for the Tiny Rebel tap takeover at the Bag O’ Nails. Having tried only one of their beers previously, the magnificently hoppy Fubar, I had been desperate to try more but sadly none have made it as far as the South Coast. Having never been to the Bag O’Nails before, it was a good excuse to discover another pub in Bristol. I’d heard excellent things about the place so I’m not sure why it took me so long to pay them a visit. I was also keen to meet Malcolm, the handsome chap who runs the pub (he’s actually a cat so he has a human called Luke managing the place). I hadn’t expected such a lovely, bustling little pub as the one I walked into. Luckily, we found ourselves a table, although we had to be on our best behaviour as the boss was enjoying a well-earned siesta there. I started with a lovely Koochie (6%ABV) pale ale which had that lovely fresh and exotic new-world hop flavour. It didn’t take long to feel quite at home. I really appreciate going to a pub where the landlord is as passionate about good beer as I am, although Luke and I do not seem to share the same opinions on Irish craft. One of his other passions seemed to be his music collection; instead of CDs, there was a turntable with a collection of well-chosen classic albums on vinyl from classic artists such as Johnny Cash, Black Sabbath and The Doors. Malcolm wasn’t really interested in the Chocoholic. More for me then.The Doors, Black Sabbath and Johnny Cash. As I got stuck into my second beer, a delicious Cwtch (4.6%ABV) English Bitter which had that classic biscuity taste with a hint of fruit, I got talking to the guys at the table next to us. I was amazed that they had come all the way from Newport, Wales, where Tiny Rebel is based, to support their local brewery. The OH did have to remind me that it’s not that far from Bristol by train, but still I’m impressed they love the beer so much. It was an absolute delight to meet the two guys behind Tiny Rebel, Gazz & Brad. We spent a lot of time chatting to Gazz who was such a massively likeable beer geek. He told us about how they started out as home-brewers and we chatted about what we had been brewing at home. It’s always handy to get tips from professional brewers, especially as he still brews small batches to test new ideas. 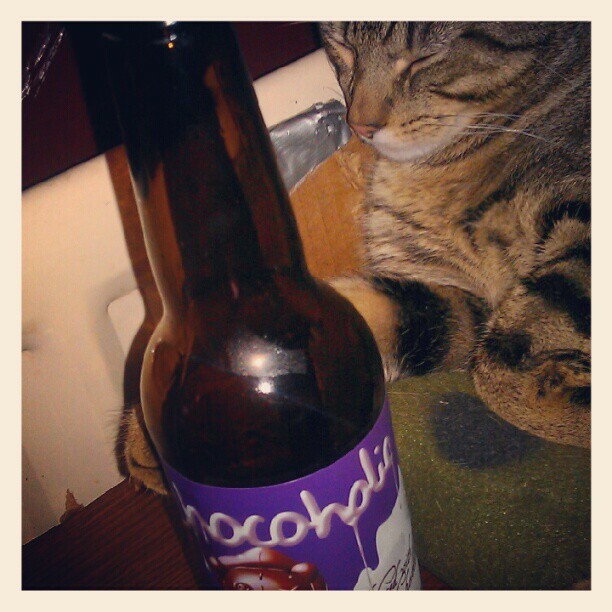 He was particularly proud of the Chocoholic (6.8%ABV) which was a beautifully bitter, smooth, rich chocolate stout. The extreme dark bitterness, I was told, was down to the raw cacao nibs used in the settling tanks. Before the mad dash for the train, there was just enough time to remind myself of the beer that had made me want to go to Bristol that day in the first place. Fubar (4.4%ABV), with its lovely refreshing hops and really big after taste of bitterness, was just as good as I remembered. Oh and I even managed to grab a growler of Koochie for the train home, although since cats evidently rule the roost at the Bag O’Nails, Luke insisted on a swift ‘customisation,’ covering the Brewdog logo with a Tiny Rebel one. I kinda like it. Although that was also when Brewdog Jonny walked in. It’s a shame we had to catch a train relatively early but you can tell what a fun day out we had by the fact that I didn’t really get round to writing many proper words about the actual beers which is even more reason that I demand that you track some down for yourself! 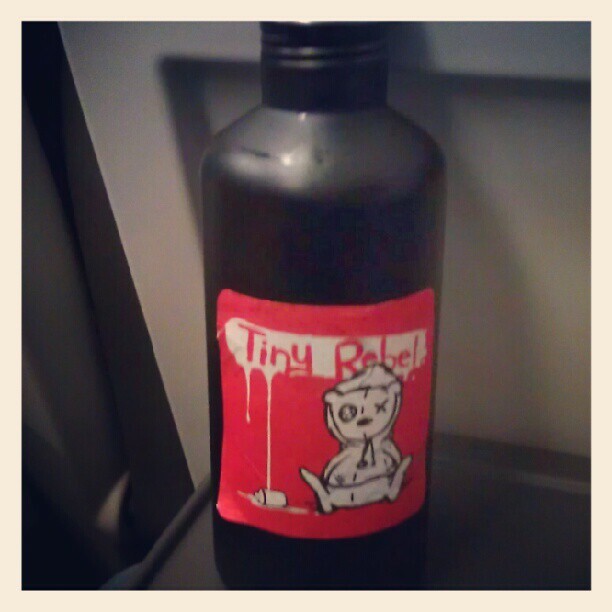 Bespoke customised Tiny Rebel growler!